Shortly after in the 6th minute, Lynda Kom smashed her shot into the back of the Sri Lankan net to double India's lead. 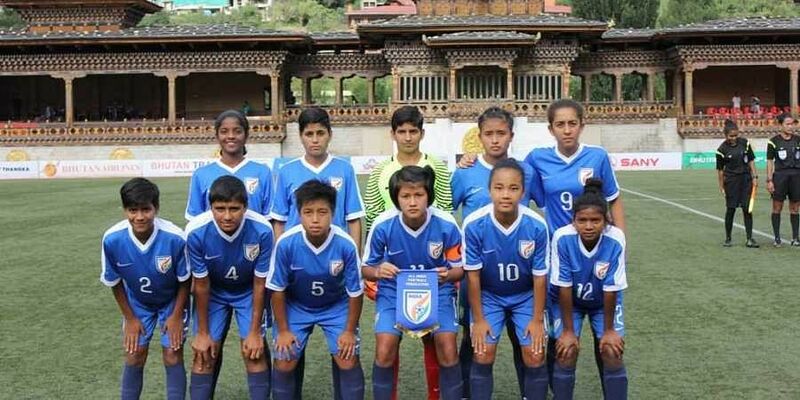 THIMPU: The Indian U-15 women's national team inflicted an embarrassing 12-0 defeat on Sri Lanka, kick-starting its campaign in the age-group SAFF Championship on a resounding note here today. Shilky Devi notched up a hat-trick (1st minute, 20', 44') and there were strikes by Lynda Kom (6'), Avika Singh (13', 58'), Sunita Munda (42', 79'), Kritina Devi (47'), Kiran (72') and Anju (87',90'). The floodgates opened in the very first minute when skipper Shilky found the back of the net from close range. In the 13th minute, Avika Singh's long-range attempt left the opposition custodian bewildered and found the back of the net to triple India's advantage. Shilky added another in the 20th minute to make the scoreline read 4-0 as India upped the ante. In the 32nd minute, Priyangka Devi's cross from the right flank was met by Sunita Munda's header but her attempt brushed the side netting on its way out. In the 42nd minute, Sunita Munda netted the ball home to make it 5-0 and Shilky completed her hat-trick just before the half-time break. Changing over, the Indian women continued their dominant play, scoring six more times.